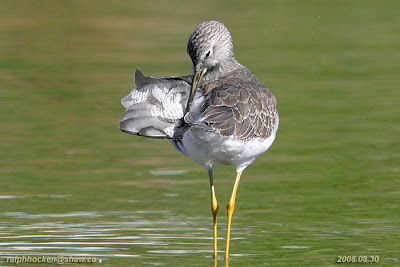 Greater Yellowlegs: Ralph Hocken Photo. We had a fantastic day for the Nanaimo Christmas Bird Count on Sunday, enjoying sunny skies, relatively warm temperatures, and mostly clear road conditions while we counted every last bird we could find in the Nanaimo count circle. Thank goodness Monday's weather didn't come a day early! Overall, I think our count for individuals of birds will be down a bit due to the amount of snow on the ground in the uplands, but our species count wasn't greatly affected. Every bit of open water was well populated with waterfowl and the coastal areas also produced good numbers of birds, although everyone seemed to remark on the lack of scoters, and Pigeon Guillemots in particular, although small numbers of each were recorded. In the upland portions of the count circle the noticeably absent species was the Red Crossbill, with only two reported on the entire count so far! Fortunately, Doug Henderson and Eveline Stokkink very graciously took a team out on the water to survey the small islands off of Nanaimo and the offshore waters of Georgia Strait within the count circle. They were thankful for the nice weather and relatively calm seas. Highlights for them were a huge pod of ~200 Pacific White-sided Dolphins that rode the bow of their boat and put on quite a show for about 20 minutes, and a good number of rock shorebirds (200+ Surfbirds and 5 Rock Sandpipers) on the Five Fingers Islands. A very big thanks to Doug and Eveline! Highlights elsewhere in the count circle included a Yellow-billed Loon off of Piper's Lagoon sighted by Karl Ricker and Jim Wisnia; a Snow Goose near Brannen Lake sighted by John Brighton and Janie Agar; a Ruddy Duck (rare in this circle in the last 10 years) in Brannen Lake sighted by Rhys Harrison and Joe Crichton; an American Kestral in the Diver's Lake/Long Lake area sighted by Martin Lane and Sandy Shaw; a Greater Yellowlegs in the Cable Bay/Boat Harbour area of Cedar by the Sea sighted by Bruce Whittington and Wanda Dombrowski; a few Spotted Sandpipers near the foot of Entwhistle Road in north Nanaimo and on Newcastle Island; an impressive 9 individual owls of 4 species including: 1 Northern Saw-whet Owl, 1 Great Horned Owl, and 1 Barred Owl recorded by Ryan and Andrew Cathers, 3 Great Horned Owls recorded by Peter and Anneke Vankoerkerle, 1 Great Horned Owl recorded by Margie Bryant, and 2 Short-eared Owls at the Nanaimo River Estuary recorded by Carlo Pavan, Val George, and Ruth Rutledge; a possible Lewis's Woodpecker was reported from Gabriola Island by Jannie Pedersen, photo confirmation is awaited; and the usual Northern Shrike was seen on the Nanaimo River Estuary by Carlo Pavan, Val George, and Ruth Rutledge; bringing our unofficial total so far to 116 species. Please keep your eye out and let me know if you see these species until midnight Dec. 31 (the end of count week) in the Nanaimo count circle (from Woodgrove Mall to just north of the Cassidy Airport). Thanks to everyone who participated this year, and especially those of you who came to the Kin Hut after the count and contributed to the potluck. It was a bit hairy keeping everything organized this year with the weeks of snow preceeding the count but it all worked out and it was a real treat seeing everyone and sharing stories with you all by the fire and with lots of good food! P.S. -- *MARK YOUR NEW CALENDARS* Next year's count will be on Sunday December 27, 2009! The rivers flow not past, but through us. A pair of Anna's Hummingbirds and seven Steller's Jays have been visiting feeders in the 3400 block of Osprey Outlook in the Hammond Bay area of Nanaimo. Four American Goldfinch, Dark-eyed Juncos, House Finch, Song Sparrows, Varied Thrush, Brewers Blackbirds, Red-winged Blackbirds, Northern Flickers, a Pileated Woodpecker and a Red-breasted Sapsucker are visiting feeders in a backyard in the 100 block of Meridian Way in Parksville. A Barred Owl, a Cooper's Hawk and a Virginia Rail were seen at Buttertubs Marsh in Nanaimo. A male Anna's Hummingbird is visiting feeders for the first time in the 100 block of Garden Road West in Qualicum Beach. 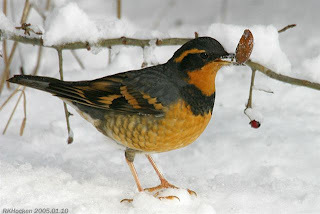 A pair of Varied Thrush are visiting feeders in Deep Bay. Anna's Hummingbirds are visiting feeders along Vancouver Avenue and Departure Bay Road in Nanaimo. 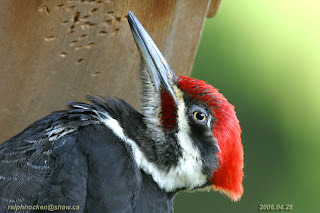 A Red-breasted Sapsucker was seen in a yard in the 4800 block of Finnerty Place in Nanaimo. Four Varied Thrush, many European Starlings, a Northern Flicker, a Red-breasted Sapsucker, Dark-eyed Juncos, Chestnut-backed Chickadees and an American Goldfinch are visiting feeders along Cosgrove Crescent in the Departure Bay area of Nanaimo. Over 100 Pine Siskins and a Ruby-crowned Kinglet are visiting a yard near Cat Stream in Nanaimo. An Orange-crowned Warbler was visiting a suet feeder along Bluebell Terrace in Nanaimo. Anna's Hummingbirds are visiting feeders along Sherwood Drive, in the Westwood Lake area and in the 5600 block of Lost Lake Road in Nanaimo. A Pileated Woodpecker has been seen in the 2500 block of Departure Bay in Nanaimo. A Song Sparrow is visiting feeders along Montana Road in Chase River. A Snowy Owl was seen at the top of Buckley Bay main Logging Road. Monday January 26, 2009@ 7:30 pm. The Tuesday Bird Walk will resume on January 13, 2009. The Sunday Bird Walks will resume on February 01, 2009. "Birding on the Lower Mainland"
There is a birding trip being planned to Reifel Bird Sanctuary and Boundary Bay on January 10, 2009. Warm Anna's Hummingbird: Thanks to Blair & Germaine Doré for the photo. A Say's Phoebe was seen at the Highway Tire Store along Highway one in Duncan. A Harris's Sparrow is visiting feeders in the 6900 of Lancewood Avenue block in Upper Lantzville. An Anna's Hummingbird is visiting feeders along Dawkins Lane in Nanaimo. 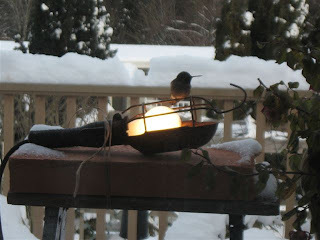 Merry Christmas--- from the Backyard Wildbird & Nature Store: Colin, Denise, Norma, Carlo, Carol, Marilynne and Neil. A Barred Owl was spotted on a patio along Boundary Crescent and Townsite Road in Nanaimo. A Rufous Hummingbird has been reported in the 6100 block of Denver Way and in the 2000 block of Cathers Drive in Nanaimo. A Ruby-crowned Kinglet and a Varied Thrush were seen at Neck Point Park in Nanaimo. Two Varied Thrush and a Red-breasted Sapsucker were spotted in the 200 block of Dawkins Lane in Nanaimo. Two Pileated Woodpeckers are at suet feeders and a Red-breasted Sapsucker and an Anna's Hummingbird are feeding on sap on a tree along Broadway Road in north Nanaimo. Anna's Hummingbirds, Golden-crowned Kinglets, Chestnut-backed Chickadees, Darkeyed Juncos, Varied Thrush, Northern Flickers, Spotted Towhees, Townsend's Warblers, Song Sparrows, Pine Siskins and Berwick's Wrens are visiting feeders in the 1100 block of Stymie Close in Qualicum Beach. Two Townsend's Warblers, three Northern Flickers, one Downy Woodpecker, Dark-eyed Juncos, Red-breasted Nuthatches, Steller's Jay, Spotted Towhees and Chestnut-backed Chickadees were seen in a backyard in Qualicum Beach. A Townsend's Warbler and an Anna's Hummingbird are visiting feeders along Andrea Crescent in upper Lantzville. A Rufous Hummingbird was coming to feeders in the 6200 block of Rose Place in Nanaimo. Anna's Hummingbirds are visiting feeders along Hardy Road in Lantzville. Two Trumpeter Swans were seen at Long Lake in Nanaimo. A Snow Goose was seen at Somenos Marsh in Duncan. Varied Thrush: Ralph Hocken Photo. The Sunday bird walk was cancelled due to the weather! A Harris's Sparrow is visiting feeders along Southwind Drive in upper Lantzville. A Varied Thrush was seen in the forest near Harlequin Crescent in Nanoose Bay. A Townsend's Warbler is visiting suet feeders along Broadway Road in north Nanaimo. The Tuesday Bird Walk went to Columbia Beach. Twelve birders saw and heard thirty-two species of birds. The surf was up and pounding on the shore on a windy, blustery December morning. Highlights of the morning included a large flock of over three hundred Dunlin and three Black-bellied Plovers flying inland over us after leaving the large gravel bar. Over one hundred Black Turnstones and about forty Mew Gulls covered the gravel bar. Further off shore several Brandt's Cormorants, Double-crested Cormorants and Pelagic Cormorants flew low over the water. Several rafts of Common Goldeneye, Harlequin Ducks, Pacific Loons, a lone Common Loon and Red-throated Loon were spotted on the choppy waters. We saw eight House Finch perched on a low bush facing into the strong winds head on. One Long-tailed Duck sped past us low over the water heading down the Strait of Georgia. A Townsend's Warbler is visiting suet feeders alone Madonna Drive in Nanoose Bay. A huge flock of Pine Siskins was spotted over Meredith Road and Thunderbird Drive in Nanaimo. The Tuesday Bird Walk on Tuesday December 16, has been cancelled. There will be no Sunday Bird Walk on December 21, 2008. WE ARE INVITING VOLUNTEERS TO HELP WITH THE BIRD STUDIES CANADA ANNUAL CHRISTMAS BIRD COUNT IN THE NANOOSE BAY & LANTZVILLE AREA. COUNT BIRDS AT YOUR HOME FEEDERS OR JOIN US ON A SMALL TEAM IN THE FIELD. 468-5466 OR JOECRICHTON@SHAW.CA OR 468-1728. The Backyard Wildbird & Nature Store's weekly bird walk in the Parksville/Qualicum Beach area is on Tuesday mornings at 9 a.m. Participants meet at the at the Parksville Beach Community Park, at the parking area in front of the playground at 9 a.m. Rain and/or heavy winds will deter us--but we will plan a walk for every week. Everyone is welcome to bring their binoculars and join us for a morning of birding. For the weekly location of the birdwalk, please call Neil Robins at 250-954-1928 or The Backyard Wildbird & Nature Store at 1-888-249-4145. 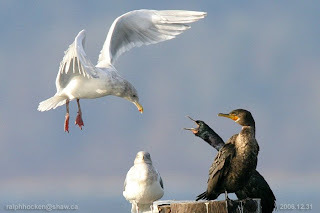 Glaucious-winged Gulls , Brandt's Cormorant and Double-crested Cormorant: Ralph Hocken Photo. 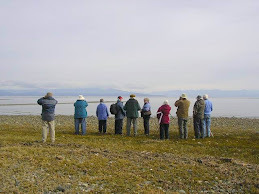 The Sunday Bird Walk went to the Plummer Road side of the Englishman River Estuary in Parksville. The highlights of the morning included seeing a Fox Sparrow and a Golden-crowned Kinglets as well as a Ruby-crowned Kinglet at the start of the walk. We saw a total of twenty Bald Eagles either perched or flying during the morning. Two Eurasian Wigeon were sifting through the mudflats and there were Brant Geese, Pacific Loons, Common Loon, Horned Grebes, Red-necked Grebes and a large flock of Red-breasted Mergangers out on the Strait of Georgia. Nineteen birders found the following fifty-one species of birds on a rainy to start but sunny end to the morning. Canada Goose, Brandt's Goose, Mallard, Green-winged Teal, Common Loon, Pacific Loon, Double-crested Cormorant, Pelagic Cormorant, Brant Cormorant, Horned Grebe, Red-necked Grebe, Surf Scoter, White-winged Scoter, American Wigeon, Eurasian Wigeon, Bufflehead, Northern Pintail, Harlequin Duck, Barrow's Goldeneye, Common Goldeneye, Red-breasted Merganser, Common Merganser, Bald Eagle, Black Oystercatcher, Dunlin, Mew Gull, Thayer's Gull, California Gull, Glaucous-winged Gull, Downy Woodpecker, Anna's Hummingbird, Belted Kingfisher, Northern Flicker, Northwestern Crow, Common Raven, Chestnut-backed Chickadee, Golden-crowned Kinglet, Ruby-crowned Kinglet, Bewick's Wren, Marsh Wren, American Robin, Spotted Towhee, Golden-crowned Sparrow, White-crowned Sparrow, Fox Sparrow, Song Sparrow, Dark-eyed Junco,Purple Finch, Pine Siskin, House Finch and Red-winged Blackbird. An Eurasian Wigeon was spotted on the tenth fairway at the Nanaimo Golf Course in Nanaimo. About two Hundred Common Redpolls flew in and were feeding in the trees near Judges Row in Qualicum Beach. A large flock of Common Redpolls landed in a fir tree in the area near the Eagles nest at Despard Avenue and Meridian Way in Parksville. Two minima race Cackling Geese with a small flock of other Cackling Geese and a Peregrine Falcon was seen at Somenos Marsh in Duncan. The Tuesday Bird Walk went to the Rathtrevor Provincial Park. Eighteen birders saw and heard thirty-five species of birds on a sunny December morning. Highlights of the morning that caught our attention included a large flock of Bushtits and Dark-eyed Juncos bobbing from bush to bush just after we started the walk. A large flock of Golden-crowned Sparrows was feeding on the ground. 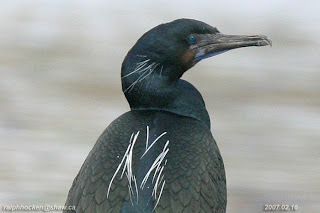 We spotted a Red-throated Loon through our spotting scopes riding the choppy seas off shore. During the morning there were several lines of Surf Scoters, White-winged Scoters, Black Scoters and Pacific Loons flying low over the water. Four Black Oystercatchers, a Herring Gull and five Glaucous-winged Gulls were resting at the point on a gravel bar. Near the end of the walk we watched as two Fox Sparrows and two Spotted Towhees fed in the low bushes near the old farm house and we listened to a Downy Woodpecker call. Eighteen birders found the following thirty-five species of birds. Trumpeter Swan, Mallard, Harlequin Duck, Surf Scoter, White-winged Scoter, Black Scoter, Bufflehead, Red-breasted Merganser, Red-throated Loon, Pacific Loon, Common Loon, Horned Grebe, Bald Eagle, Cooper's Hawk, Black Oystercatcher, Mew Gull, California Gull, Herring Gull, Thayer's Gull, Glaucous-winged Gull, Downy Woodpecker, Hairy Woodpecker, Northern Flicker, Northwestern Crow, Common Raven, Chestnut-backed Chickadee, Bushtit, Winter Wren, Golden-crowned Kinglet, American Robin, Spotted Towhee, Fox Sparrow, Golden-crowned Sparrow, Dark-eyed Junco and Pine Siskin. A huge flock of Pine Siskins were spotted over Meredith Road and Thunderbird Drive in Nanaimo. The Tuesday Bird Walk on Tuesday December 09 will be going to Columbia Beach. Meet at the Parksville Community Park at the parking area in front of the playground area at 9:00 a.m. or at the parking area off Admiral Tyron Boulevard( turn at Columbia Drive off Highway19a go to the tee intersection and turn right onto Admiral Tyron Boulevard go about 100 meters and turn into the parking area.) at about 9:20A.M. 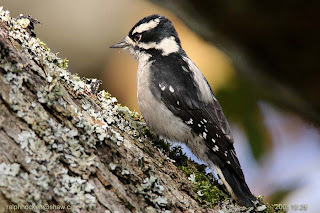 Meet at the Bird Store at 9:00 A.M. or the parking area at the beach behind the Church Camp off Arlington Road ( off highway 19a at Arlington Road) at about 9:15 A.M.
Downy Woodpecker: Ralph Hocken Photo.